Here is a chronological sample of my versatile digital content output, marketing and social media presence filed on immediate deadlines during a 14-hour period. The content below was produced out of a Nashville Predators-Washington Capitals gameday on Jan. 16, 2015. There are a total of five stories and three mobile shot/edited videos contained on this page. The written content was printed in The Tennessean the following day. The coverage begins at the morning skates, continues into live social coverage of the evening game, and concludes with postgame interviews and my analysis. The main storyline that day was the return of coach Barry Trotz for the first time as an opponent. He coached the Predators for 15 seasons. Here are the lines at the Predators morning skate Friday at Bridgestone Arena ahead of tonight’s game against Washington (7 p.m.). Check back later to Tennessean.com for more updates ahead of the game. It is the trade that looks really good for the Predators these days. 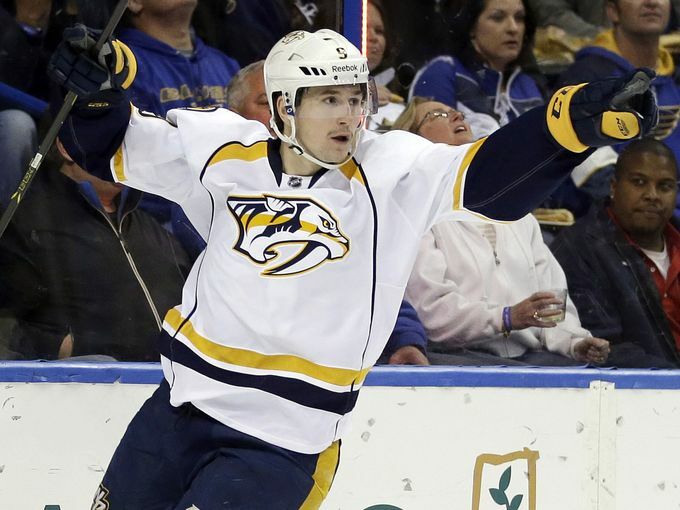 Filip Forsberg — Nashville’s leading scorer — was drafted 11th by the Washington Capitals in the 2012 entry draft, then acquired by the Predators in an April 2013 trade for Martin Erat and Michael Latta. Forsberg, 20, will face the Capitals for the first time as a professional Friday night at Bridgestone Arena. The Calder Trophy favorite enters the game with 15 goals and 24 assists, and a plus-23 rating: numbers that leads all rookies. Erat had two goals and 25 assists in 62 games with the Capitals before he was traded to Arizona. He has eight goals and 16 assists in 60 games with the Coyotes. Forsberg honed his skills with Milwaukee in the AHL last season and has a firm position on the Predators’ top scoring line this season. Predators backup goaltender Carter Hutton is looking forward to the repetitions and the playing time while starter Pekka Rinne recovers from a sprained knee. Rinne is expected to miss three to five weeks. Hutton, who has 48 total starts in his NHL career, played 40 games last season when Rinne missed 51 games with a hip infection. Like everyone in the building Friday, Hutton took a moment while on the ice to watch the video tribute to Capitals coach Barry Trotz on the videoboard in the first period. Capitals coach Barry Trotz watched the Predators practice from the visiting tunnel Friday morning at Bridgestone Arena, saying hello to some of his former players. Some of those players greeted their former coach, who was back in Nashville for the first time as an opponent, in their own unique way. It was an unfamiliar scene in a familiar place for Trotz, who spent the previous 15 seasons coaching the Predators. “I am emotional when it comes to certain things — family and children,” Trotz said before Friday’s game, a 4-3 Predators’ victory. Outside of that feeling, Trotz is comfortable these days in Capitals’ red and treated the past few days like a typical business trip. He no longer has his home in Brentwood, so he chose to spend most of his Thursday in Nashville “low-key” and at the hotel. On Friday, he prepared in the visiting coaches office before stepping out to the bench area to watch the practice. When the Capitals took the ice, Trotz followed, and he chatted with the Zamboni driver before running the players through drills. He viewed the matchup against the NHL-leading Predators as a “benchmark” and was fully aware of the Predators’ 17-2-1 record at Bridgestone Arena heading into the game. #CAPS GOAL: Ovechkin goes shortside corner on Hutton with 16:14 left in the second. Crazy good goal. #Preds 2, #Caps 1. #CAPS GOAL: Ovechkin again. From basically the same spot. PP goal. #Preds 2, #Caps 2. 13:42 left in the second. Power play coming up and a big chance here for the #Preds, down 3-2 to the #Caps with 5:14 left in the third. FINAL: #Preds 4, #Caps 3. Hutton gets his first win of the year in Trotz's return to Nashville, fifth straight win for Nashville. Barry Trotz put his hand over his heart and then took a few bows. After that tender exchange with the Bridgestone Arena crowd, there was still an entire game to play. The Predators needed a late rally to beat Trotz and the Capitals 4-3 on Friday night in his return to Nashville for the first time as an opponent. Mattias Ekholm and James Neal scored in the final five minutes of the third period to give the Predators their season-high fifth-straight win. Ekholm tied it on the power play with 4:29 remaining, and Neal stole Matt Niskanen’s pass to beat Washington goalie Braden Holtby with 1:40 left. Trotz, the Predators’ coach for the previous 15 seasons, was cheered by the crowd during lineup introductions. The loudest cheers came while a video tribute played on the videoboard early in the first period. For the NHL-leading Predators, Friday’s game was the first of what the team is expecting to be a three-to-five week stretch without starting goalie Pekka Rinne (sprained knee). Backup goalie Carter Hutton had 31 saves, earning his first win of the year in his sixth start. The Predators got out to a 2-0 lead on a slap-shot goal from Seth Jones with 3:44 left in the first period and a goal 1:50 into the second period from Neal. The Capitals followed with three consecutive goals, two coming on the power play. Alex Ovechkin scored back-to-back goals just over two minutes apart in the second period, picking the tight space above Hutton’s blocker. Washington went ahead 3-2 on the power play 2:38 into the third period on Marcus Johansson’s goal off the rebound. Ekholm’s goal: Defenseman Mattias Ekholm smiled when asked whether he thought the Predators’ rally in the third period would start with him. Ekholm’s power-play goal with 4:26 left in the game tied the score 3-3. James Neal scored the go-ahead goal with 1:40 to play. Record: The Predators set the franchise record for fewest games to 30 wins, beating the 2006-07 team that picked up win No. 30 in the 44th game of the season. The Predators are 30-9-4, tied with the New York Islanders for the most regulation wins and the last team in the NHL under 10 losses.